JOHNNY JOHNSON….was my “boss” during the winter of 44/45 in Belgium which has been declared the coldest winter in 50 years…I believed them…man it was cold…How cold was it you ask? You don’t want to know. Back to Johnny Johnson who was a British fighter pilot during the Battle of Britain 40/41…ended the war with the most “kills”. 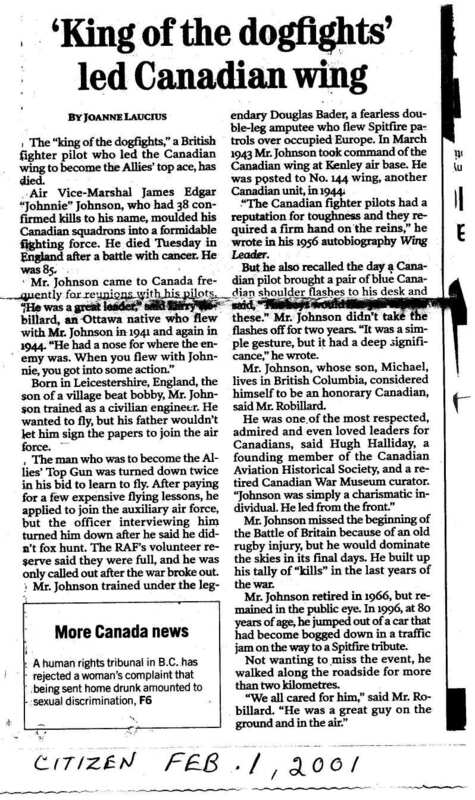 My wife and I had a short breakfast with him in his room at the Château Laurier about 25 years ago on the occasion of the annual reunion of the Fighter Pilots’ Association. I had been invited as a member of the 2nd Tactical Air Force Spitfire Wing. and I had met most of them at some time during the campaign. He gave me his home address which is shown somewhere on this cd. Now I remember how cold it was…one day he asked me to take his 1939 Buick (which had been “given ” to him and get it checked at one of the garages in Brussels…On my way back to the airfield the car stalled and would not start. Finally reached his trailer office, did not wait for an explanation, picked up the phone and threw it at the car…missed me by “that much”. Otherwise he was a very sociable and friendly guy in spite of his rank. His Spitfire which bears the initials JE J (as shown on this cd) was at the Aviation museum just as you go in the from door. I have not been there for a few years although I live 5 minutes away. Maybe I’ll go back and check one of these days. John Le May had kept 100 documents he had typewritten during WWII along with dozens of never seen before pictures. 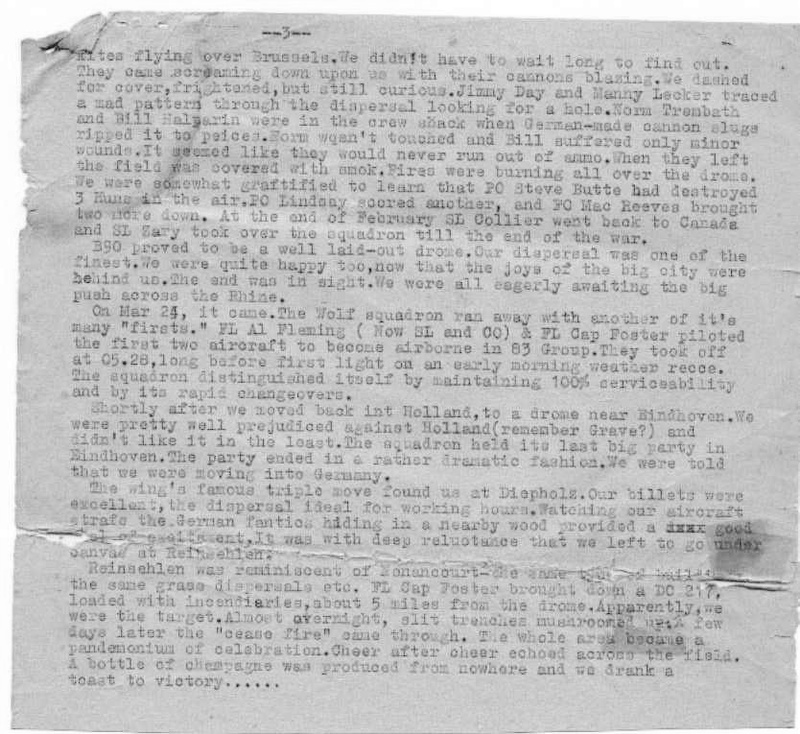 Here are the original copies of the history of 403 Squadron that I found on the CD he sent me. Johnnie Johnson obituary found on the Internet. In 1937, “Johnnie” Johnson tried to join the Auxiliary Air Force (AAF). On hearing that he came from Melton Mowbray, Leicestershire, the interviewing officer said, “My dear chap, you’re just the type. Which hunt do you follow?” When Johnnie said he did not even ride a horse, he was promptly shown the door. Little did that interviewing officer think he had just rejected the man who, in the second world war, would shoot down more of the enemy than any other pilot in the RAF – and without ever being shot down himself. Johnson, who has died aged 85, was born at Barrow-upon-Soar, Leicestershire. He was a rather wild youth, and his father, a policeman, is reported to have said: “You’d better be either a policeman or a pilot.” In fact, after attending Loughborough College and Nottingham University, he qualified as a civil engineer. Without any further objective in mind, he also became deadly with a shotgun, with an average (he wrote) of two rabbits with every three shots. Realising that the AAF was at that time an exclusive club, he then tried the RAF Volunteer Reserve, to receive a second rejection. 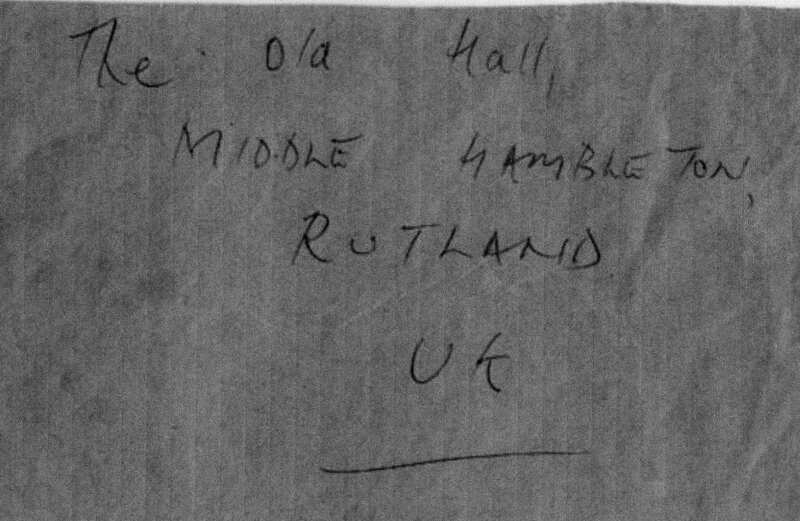 He eventually managed to join the Territorial Army, but in 1939 war clouds were gathering, and he was called up into the RAFVR. To his delight, he managed to be selected for pilot training, and found himself at Marshall’s School at Cambridge. At 23 he was older than most of the pupils, but he did well, and in summer 1940 he went to Hawarden in Cheshire to learn to fly the Spitfire. 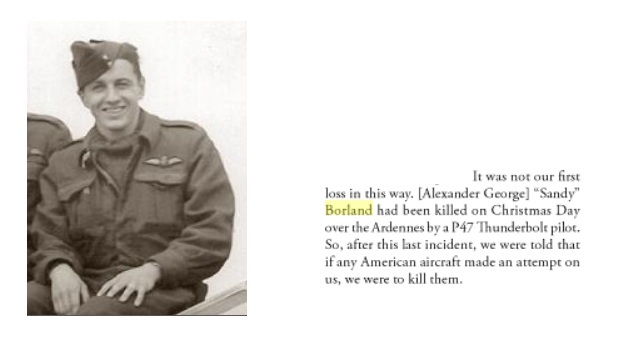 On his fourth flight he pranged (crashed), but in September he was commissioned and posted to 19 Squadron, and then to an AAF unit, 616 Squadron. Exhausted, the survivors of 616 were being rested and reorganised away from the battle at Kirton-in-Lindsey. Here, Johnnie put in as many hours on the “Spit” as he could, but he found his flying handicapped by a painful old rugby injury. He tried to fly with his left hand, but eventually had to report his difficulty. The instant reaction was “Has this chap gone LMF?” Lack of moral fibre was a heinous crime, but Johnnie soon convinced the authorities that he was exactly the opposite. 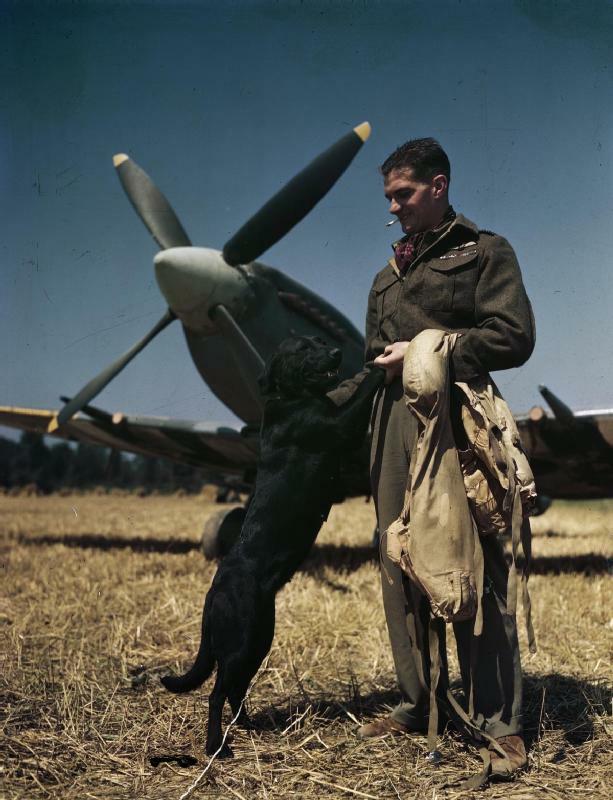 An operation cured the problem, and from then on Johnson be came a deadly killing machine, not only the master of the Spitfire but also – unlike almost everyone else – a master of accurate deflection shooting, learned against agile rabbits. The only problem was that the great Battle of Britain was over, and “Huns” were hard to find. 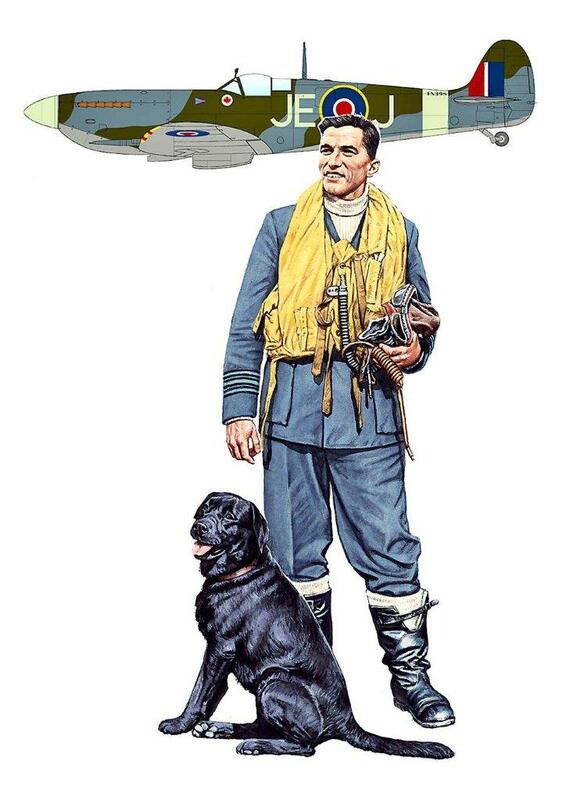 In February 1941, 616 became part of the Tangmere Wing, which a month later was given a new wing leader: Douglas Bader, the famed pilot who had lost both legs in a pre-war crash. Johnson soon became Bader’s No 3 (“Cocky” Dundas was No 2), a marvellous position at the front of the wing, but frustrating in that No 3’s job was to cover the leader, not to go off chasing enemies. By May 1941, Bader’s wing was taking the offensive over France, and Johnson began to learn his trade in actual combat. 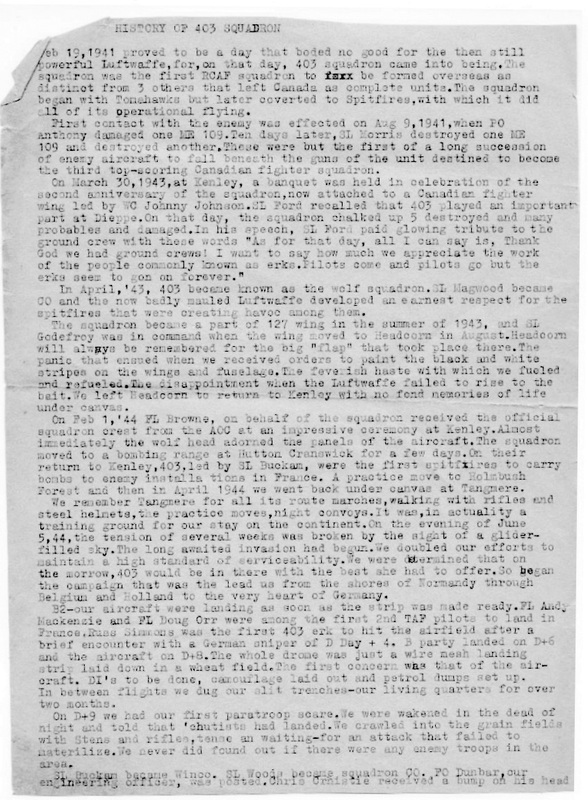 A month later, 616 was badly “bounced” over Gravelines. Johnson found himself alone, and suddenly saw a Messerschmitt 109 in front of him. 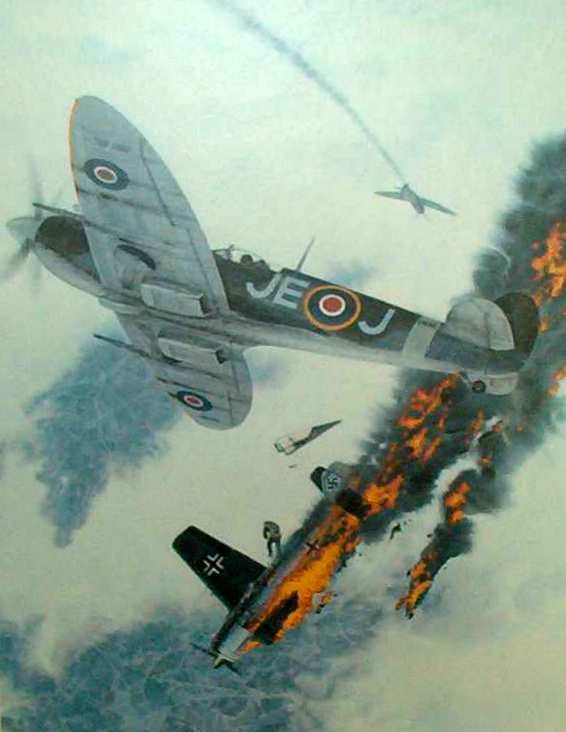 Unlike most RAF pilots, Johnson hit with his first burst. He saw the pilot bail out. From then on, there was no stopping him. 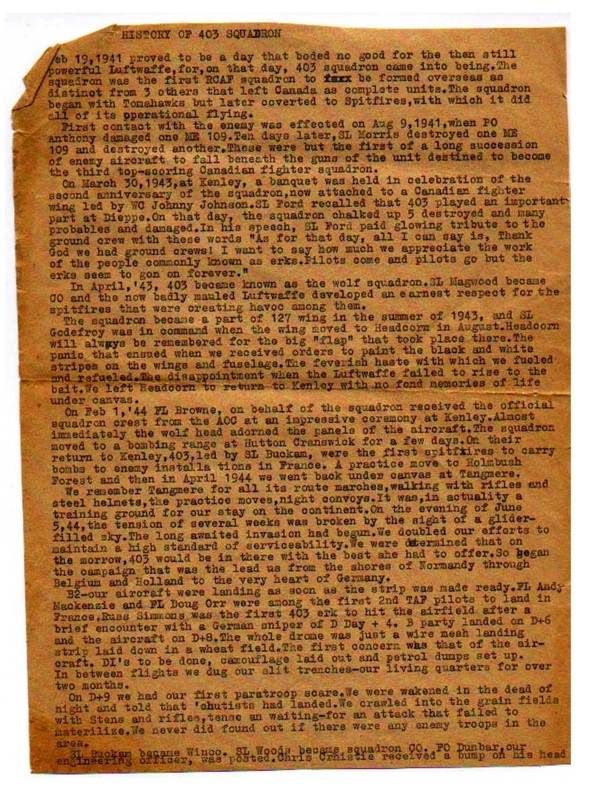 In mid-September he was promoted to flight lieutenant and given command of B Flight. Eyeing their new English CO keenly, they need not have worried. On the first occasion they met the enemy under his command, they shot down six of the dangerous Fw190s. One fell to Johnson, raising his score to nine. Johnson was just what the Canadians had prayed for: an aggressive leader. 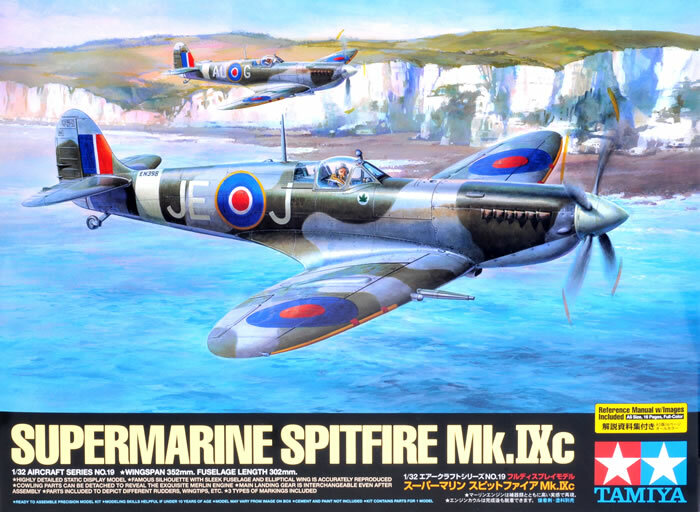 As wing leader he could paint his own initials on his Spitfire – now a far superior Mk IX – and he adopted the radio call sign Greycap. By mid-year his own score had reached 20. Then he was frustrated by being given a staff job. 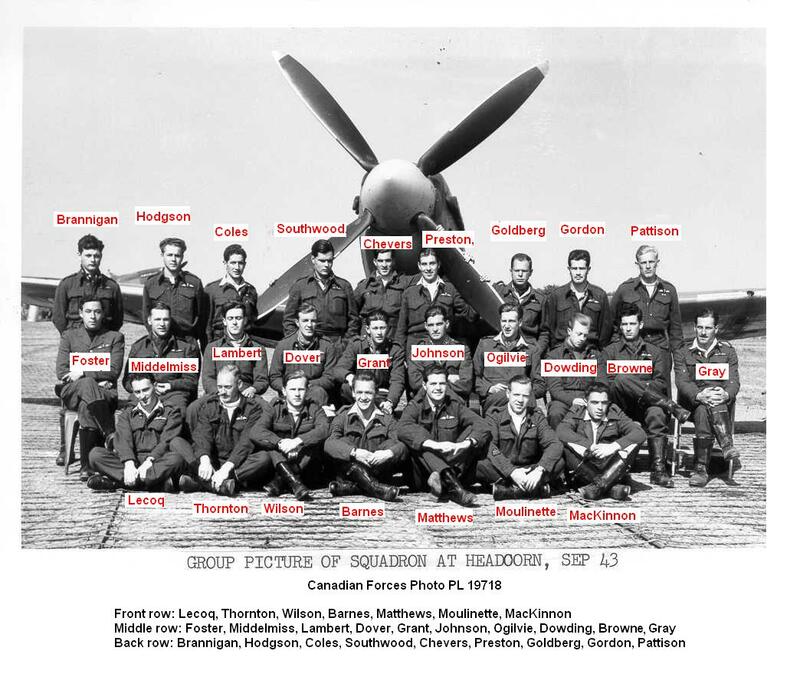 But in March 1944, he was switched to command a different Canadian wing in the newly formed 2nd Tactical Air Force. After D-Day he organised barrels of beer to be slung under the Spitfires in place of extra fuel tanks, a move welcomed on the dusty front-line airfields of Normandy. Just at this time he overtook “Sailor” Malan’s score of 32 confirmed victories. When VJ-Day came, in May 1945, his score was 38. Officially this remains the highest total of any RAF pilot, though it is widely believed Sqn Ldr St John Pattle exceeded 40 in the turmoil of the Greek campaign. 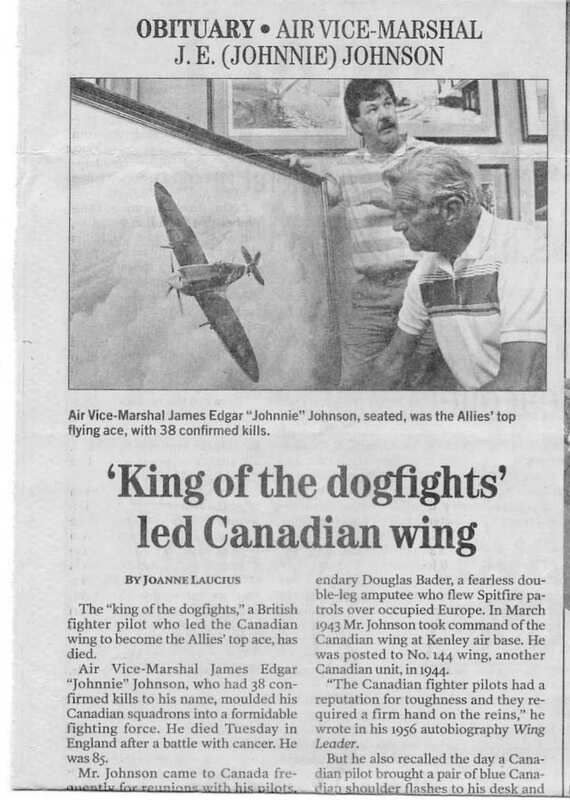 Perhaps Johnson’s most impressive achievement was that, in some 1,000 combat missions, he was never shot down. Only once was his Spitfire damaged by the enemy. Apologising, he said, “I was surrounded by six of them.” He was awarded the DSO and two bars, the DFC and bar, the Belgian Légion d’Honneur and Croix de Guerre. 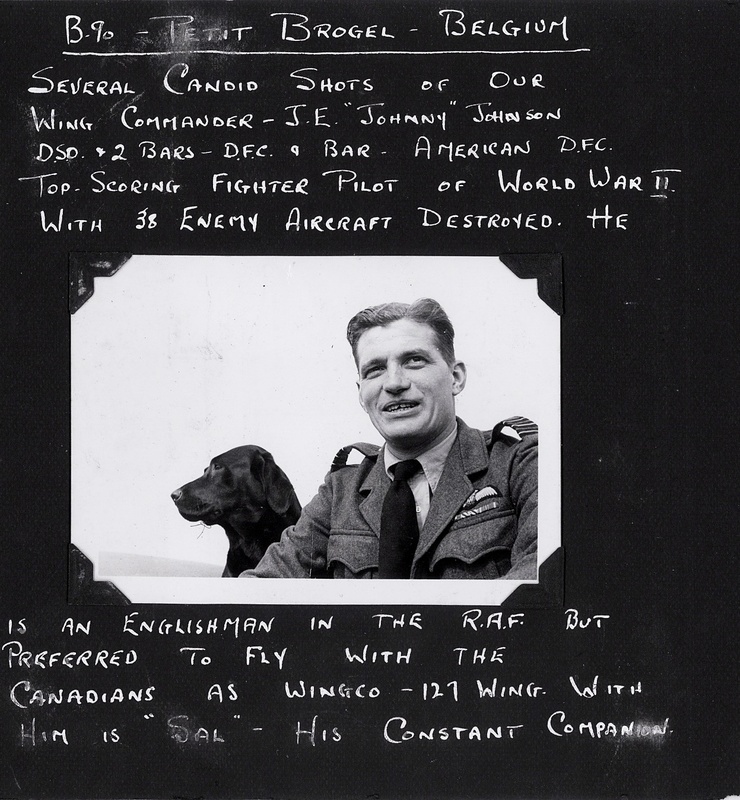 When he had written his autobiography, Wing Leader, he asked Bader to contribute a foreword. His old CO wrote back “Dear Johnnie, I did not know you could read and write.” That was Johnnie in a nutshell. 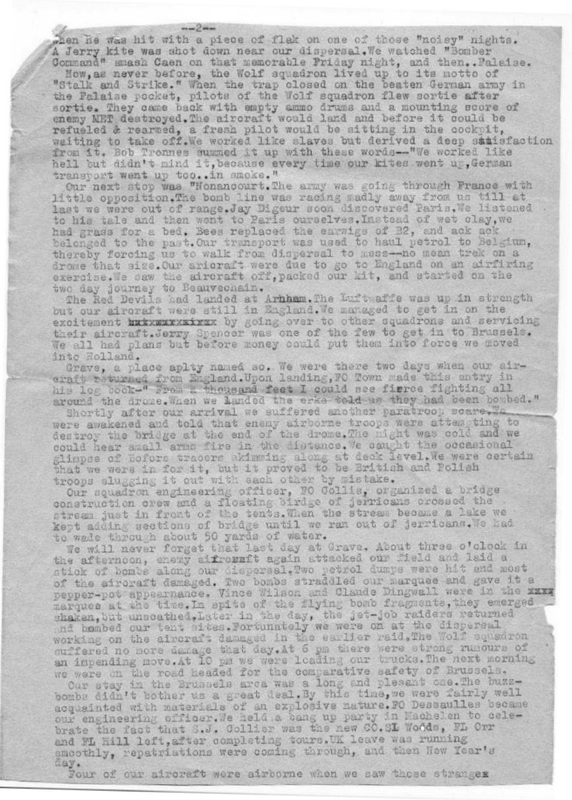 Air Chief Marshal Sir Christopher Foxley-Norris, chairman of the Battle of Britain Fighter Association, writes: Johnnie Johnson’s performance was even more creditable because he largely missed the Battle of Britain and won his “kills” in fighter-to-fighter combat rather than against heavy bombers. If they numbered less than the German fighter aces this was because the Germans included their hits against the less-skilled Russians. Johnnie’s kills were hard-earned, but then Johnnie had the two skills needed to be successful: he was a good shot and a good pilot. Lots of people were good pilots, but Johnnie was also a good shot – gifted in the art of deflection shooting. Before the war he had been a game-shooter, a sort of “Lincolnshire poacher”. He was certainly tough – and demanding, both on and off duty – but then you had to be. I was fond of him, although he wasn’t always easy. And I wished I had been tough like him. This is post No. 275. It’s from Mark White, and it’s a great one! 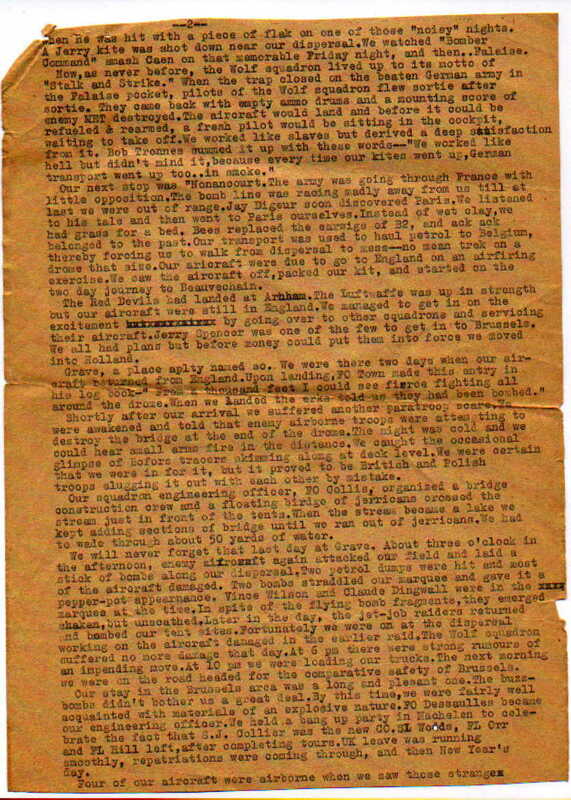 I have some wonderful notes from the ERK Journal about 403 Squadrons activities during Operation Market Garden. 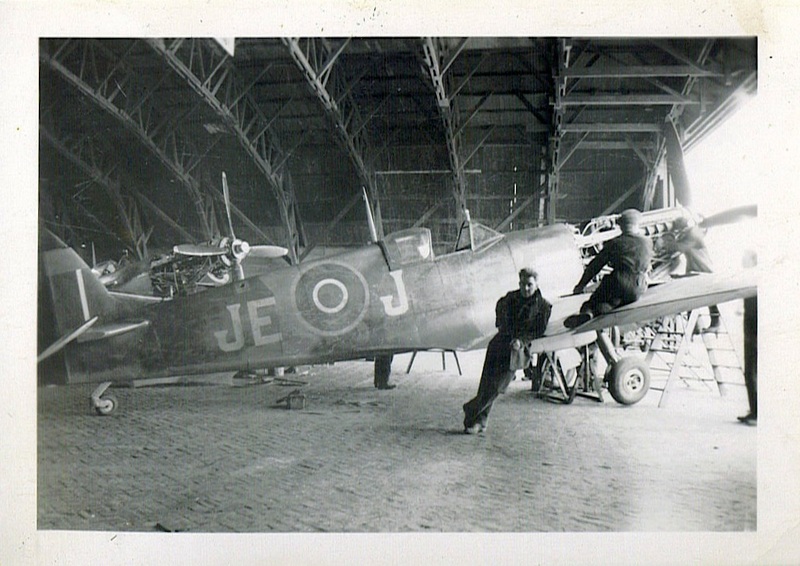 The Squadron moved into Holland and set up an Airfield at B82 Grave Netherlands. 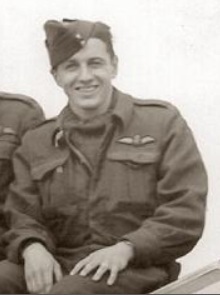 The picture I have of JEJ was likely taken at Eindhoven Holland around September 26 1944 when 403 Squadron met up with an Officer who informed them of “their best road chance” to make it to the not yet accessible base at Grave. 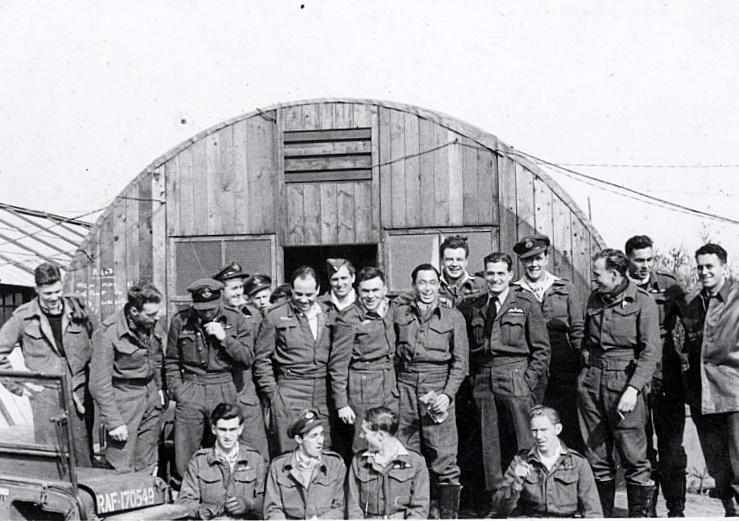 127 Wing left Base 68 at Le Culat Belgium on September 27 1944. There next airfield was Base 82 Grave Netherland where they remained until October 21 1944. The main party arrived on October 1, 1944. Greg’s grandfather had some pictures of Johnnie Johnson in his photo album. Greg will scan them for us. Johnnie Johnson is a well known figure. That’s what caught my attention in September 2011 when I was looking at Walter Neil Dove’s photo album. 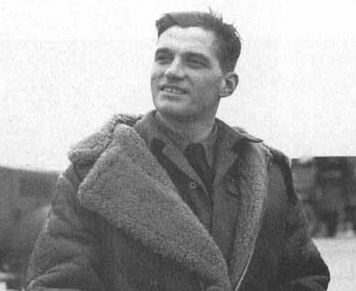 Johnnie Johnson was more than the RAF top ace. From John Hawley who was an Erk in the RCAF. In my Air Force experience the best aircrew/pilots were those that respected their Groundcrew. Met AV Marshall J.E. 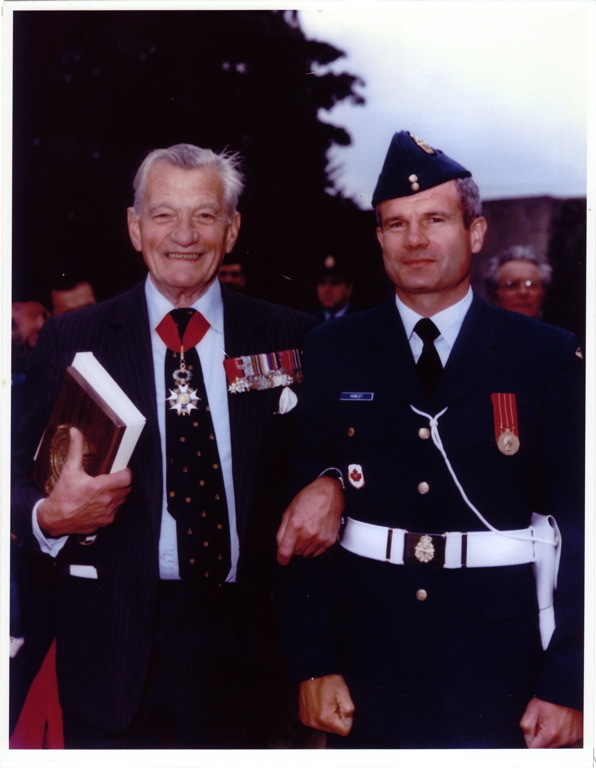 Johnson, RAF in France in 1989. This famous Ace remained ‘best of friends with his WWII Crew Chief (ERK) until his death. Johnnie Johnson was well respected by his pilots and technicians.